I was at Blists Hill Victorian Town for the 4 days of the Jubilee Holiday. The other joy of Blists Hill is the folk I get to meet who work at the Living Museum , in the various shops and houses and workplaces. My Meandering around the site , tin mug of tea in hand , telling all the passers-by the time of the next Punch Show , took me into the woodcarvers workshop this time ( a place I had not discovered before ) . In there was a smashing bloke called Malcolm who was part way through batch building a few small rocking horses . Even though I told him I don't carve my puppet heads in any kind of conventional way -ie; with chisels - he was very keen to show me the different scoops and cuts his razor sharp set could achieve ..and also how different woods react to the same chisel etc. It was wonderful stuff and ( almost ) left me yearning for a smart row of differently shaped sharp chisels hanging up in my workshop ....a bit like Cobalt Blue has . The only chisel I own is very old and truly blunt : I keep it to open paint tins with. Sanity prevailed and I resolved to stick with my bandsaw and profile sander. Malcolm asked what I made my figures from ?..I said just Pine , or sometimes pine reinforced with a plywood profile down the middle . One was a genuine off-cut of something he called 'Tulip wood" ? ( But only an 'off-cut' by his definition , in that it had a knot in the centre ...but by using the wood around the knot carefully there is enough wood for four or five heads !- so in my book it was far from being an off cut ). And the other wood he gave me, he cut from a huge thick plank .. . it was a generous block : enough for two heads - and it turned out to be jelutong. I was really touched , what a nice guesture. I actually have a head sized block of jelutong already ...Mark Poulton was equally generous in giving it to me about 3 years back when I visited his workshop at his house. But I have shied away from daring to use it , because I assumed it was very costly , and partly as I imagined I would probably have to scour the Country to find a supplier for it if I found that I developed a taste for using it. I convinced myself any wood merchant keeping it in stock would be so far away that the additional courier / postal costs would make this expensive wood even dearer ....so I sort of decided not to develop a taste for it by leaving it sat unused on its shelf ( probably maturing well for carving no doubt). Up till now I had only seen little blocks of Jelutong on Geoff Felix's bench or at Mark Poultons ...in both places they were already cut into head sized nuggets , and offered for me to look at and handle with a reverence and awe befitting an equal sized chunk of pure Aztec Gold. So I figured this Holy Grail of all Woods , must be available to buy somewhere. 2 minutes on the Internet produced Sykes Timber , which must be all of 17 miles from my front door . Dunno why I didn't look before. A helpful chap on the phone there let me know that they had plenty of Jelutong , and also Lime ...not quite as light he said but just as good for puppet heads. Malcolm was making the rocker parts for the horses by glueing together arcs cut from matchwood, or possibly pine. They were drying on a bench ..not clamped or cramped together as I had expected , and with what looked like yellowish expanding wall-insulating foam oozing out from between the slices. No G-Clamps ..just the parts pressed together with this frothy foam holding them together. Was it expanding foam ? It looked so much like that , that I was dumb enough to ask him if that was actually what it was. He said no , but like that foam it was resin based. It looked like regular PVA wood glue , but then the natural moisture in the timber caused a reaction in the glue that caused it to 'foam up' and cure. And it cured fast ...30 minutes to full strength. Useful I thought, if you should wake up in the morning with a yen to carve a head , but have not glued two or three bits of pine board together to make ahead sized lump ( mind you now Ive properly been awakened to Jelutong I might not need to do so much of that kind of thing ). I just wondered if anyone else used the stuff, and could say if it was suitable for puppet heads ? ..I guess if it does for rocking horses , then punch figures should be no problem ? Yes, it is like the expanding foam Richard, it too is polyeurothane. There are some seaside kiosks near me which have wooden furniture for their patrons, and I've seen this glue used for repairs so it is pretty tough and waterproof. The only thing you would need to test is whether it is chisel friendly - that is if you are using it to laminate carving wood and are using chisels to carve - you want it to cut cleanly and not to chip the chisel edge. For those who carve with bandsaw and sander I don't suppose it matters. If you've a choice between jelutong and lime do go for lime for carving. However for bandsaw work jelutong may be perfect - I know it's widely used in pattern making. Thanks Chris ..I appreciate the advice from a man who really knows his carving. And he did show me that you can chisel across a wood/glue/wood sandwich and the glue when set behaves just like wood. Also for doing anything to be stained not painted ..it takes the stain or varnish the same as wood, so it can be used to glue and fill simultaneously. And now you mentioned the seaside , Malcolm said the glue does indeed do everything it says on the tin ..including being outdoor waterproof ..including sea water. So I am deffo going to get me some and try it out for myself. ..But for puppet making ... it works for sure , but actually good old fashioned PVA wood glue has the upper hand. Blured ..but shows the 'foaming' at the joint. It has taken a look at a new type of glue ( well new to me ) ..for me to fully appreciate just how versatile bog standard PVA wood glue is . ** It glues two bits of wood together. ** If a small quantity is left for a few days in the bottom of a jam jar ..it 'thickens' - great for brushing into cracks or joins. 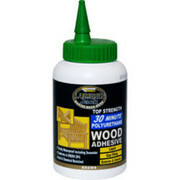 ** fine sawdust can be mixed with either regular or the 'thickened' glue to make a great filling paste. Last edited by Richard Coombs on 22 Jan 2013, 11:11, edited 3 times in total. You are right Richard, a very versatile product. You can use it to seal dusty walls or concrete floors. You can use it, thinned, as a protective coating for outdoor posters. You can mix it with sand and other materials to make textured modelling materials for model railway scenery and landscapes and you can model and mould with it. An early brand of PVA glue was sold as Marvin Medium to the school and craft market. Puppeteer Paul Doran (Shadowstring Puppets) made all his early puppets, if I recall correctly, using a mixture of sawdust and Marvin Medium which I think he modelled directly.He got some very good results and possibly he is still using the same method. I remember I played around with the stuff but without much enthusiasm since I was, at the time, completely sold on Rawlplug Plastic Wood as the perfect all-purpose puppet product. Crikey .... there's a blast from the past ..Marvin Medium ... I dont ever remember using it ... but I am sure there was always a big 5 litre container of it in the Art room stock cupboard at school - of course it would have been in gallons back then. It never seemed to get used , but it was always 'there' . I dont even recall it being a PVA type of glue ...as I dont think it ever got opened or used. And altho the name is so vivid I cannot remember the design on the container or the colour ( of course the World was only in Black and White back then anyhow ). As you say Chris the uses for PVA are virtually endless it seems. I do recall a 'making of' type of programme from the BBC , back in the 70s ..when Making Of ( or Behind the Scenes) were a rare glimpse into a secret world ...not the everyday accompaniment to every TV show and Film. It was showing costumes being made for a BBC costume drama ...either the Six wives of Henry the Eighth or Elizabeth and Essex ...that sort of period anyhow. These were made by covering fabric with hundreds of brightly coloured lentils , dried beans , seeds of all sorts and lots and LOTS of PVA glue. The result from any small distance ( and in a pre digital age) was of a highly embroidered cloth that would have taken thousands of man hours to produce. That little nugget of lost memory came back to me when I was sewing about 150 beads to the stomacher of my Queen Elizabeth 1st Puppet. £8 for a litre, £30 for 5 litres. Relive your schooldays Richard. oh, and that you can also mix PVA adhesive with cement to make it stronger. Cheers Chris ...I am assuming it mixes more 'reliably' with say acrylic paints than Evostick PVA wood glue ? By that I mean that wood glue does mix with paint , but best in very small quantities of either at any time , gradually increasing either part if you need bigger amounts ---it sort of 'curdles' if you rush the process - but this will rectify itself with more and vigorous mixing. My guess is that Marvin is formulated to combine with paint more evenly / quickly / and in larger quantities ? Any Idea how it fares as a Glue ? ...would you for example ,reverse the cross-over and use Marvin to glue two bits of timber together if making a puppet head ? If not , then for all-round versatility I will stay with wood glue ( currently Screwfix's own brand ) ..this I blanket use for everything. But then taking a Pro approach , I suppose I should buy a small bottle of Marvin and try it with paint. Then use Wood Glue for Sticking, and Marvin when Painting . Well personally Richard I would only mix pva glue with paint if I wanted a coloured adhesive. If I wanted to thin acrylic paints then I would use the related acrylic medium. I am a great believer is using the best tool for the job so long as you can afford it. Obviously the best medium for, say Windsor and Newton paints, is the medium developed for and used in the manufacture of those particular paints. Their chemists will have spent yonks trialing and testing their products to get the optimum results. I rather think Marvin medium was/is marketed as a PVA medium - that is, mix it with powder colours or poster colours and thus create your own acrylics. But as I mentioned, my own experience with Marvin was very cusorary, Paul Doran was the enthusiast. As for comparing Marvin as a wood glue compared with something developed especially as a wood glue - well I would always choose the specialist product. But I imagine most of the difference between the different pva glues is the volume of water included. so its really a case of finding the one with the viscosity you prefer. I personally don't use a lot of PVA - my standard adhesives (solvent) are Bostic or Uhu and (resin) Araldite. 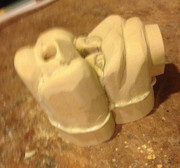 I use flour and hot water paste for papie mache. I do use Evostik PVA for wood - and I use acrylic paints for speed - but actually much prefer oils.